Since the time in Japan is ahead of the U.S. (by about 15 hours), I cannot go home at the same day I leave Wichita. The tickets for this round trip was $1269.70. 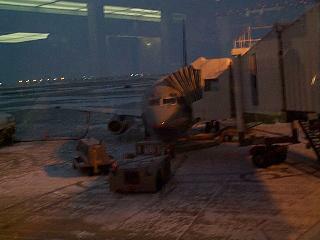 I left Wichita at 8:05AM in United Airlines flight 1628, arrived Chicago O'Hare International Airport at 9:50AM. 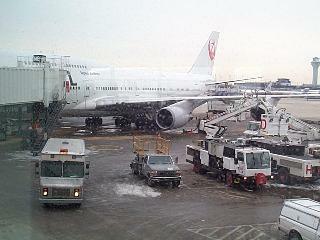 At the airport, I checked in at Japan Airlines counter and waited for the airplane. I ate at McDonald's in the U.S. for the last time, and bought some wines for my family at duty free shop. The plane, Japan Airlines flight 9; from Chicago to Tokyo (Narita International Airport) departed the gate at 12:00PM (December 18th). for next 13 hours will be a long trip back home. I should be in Japan around 4:00PM (December 19th). I was in the airplane pretty much whole day, with lots of Japanese folks... Since I am an oversized Japanese, it was a pain to just sit there. JAL (Japan Airlines) provides good service always, but the seat seems a lot smaller than the other airlines in the U.S. The good thing about using JAL (Japan Airlines) is it has a direct shuttle plane to my hometown, Nagoya. The flight 53 took off Narita around 7:00PM, and arrived Komaki Airport around 8:15PM. I woke up at 6:30, as my brother wakes up. The radio I hear was something funny, because I am so used to listen to English, I didn't understand what they are saying... Later in the evening, I bought a cell phone. Japanese one is pretty good. I can even talk in subway station or underground malls. According to the news, 50% of household in Japan now have at least one cell phone. The cell phone system is not the only systems. The cheaper version of the phone called PHS, strands for "Personal Handy-phone System", is also famous. That one can use the phone as a transceiver too. Other surprising thing called the "i-mode". This one is a bomb! I can send, receive e-mails within a certain length. Some of them are in color, with gorgeous sound (like the sound card in a computer), showing maps.... They do everything. From yesterday I started to help my family since I do not have a job here. It is good of me that I am tall, but I cannot through the doors in my house without bending my body, otherwise I will have a big scar on my forehead. I tried to make appointment with the U.S. Embassy to get renew my student visa, but the system is not working well. I have to call them, and receive a fax. However, I have never get one. O-Oh. I sense a problem, I hope I can go back to the U.S. The book stores, CD shops, are changed. They used to have lots of books I wanted, but now they have only books/CDs which they are sure to sell. I couldn't find some books related to aerospace engineering. I finally got a paper to have an interview for my student visa. I will be going to Osaka on 12/28. I hope they will let me stay in the U.S. Two more years so I can finish my school. Copyright 2001 - Kosuke Ishikawa / Unauthorized copying of contents, partcial or whole, is not permitted.